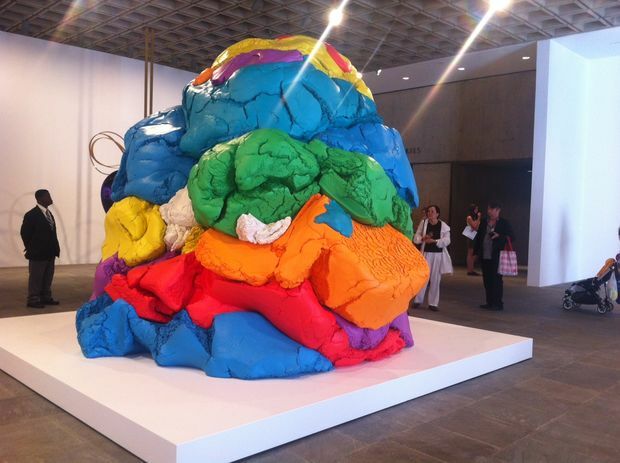 by Neve D.C. and Lucy C.
You probably have heard of Jeff Koon’s exhibit at the Whitney Museum. If you haven’t, Jeff Koons is an exceptional artist who bases his ideas on kids’ toys and their imagination. Some of these sculptures include a Hulk organ, A play-Doh sculpture, and a bunny with a flower. Since the Whitney is moving downtown, the fifth-grade classes went to see his amazing artwork. A sculpture that really caught our attention as soon as we walked into the big room was the gigantic Play-Doh sculpture. The story behind this piece of artwork is very funny. It all started when his young son made a big lump of Play-Doh and went into his office to show his dad. “Voila!” he said. Jeff Koons admired his confidence. So, over many years, he made an exact replica of his son’s sculpture, except a lot bigger. It was interesting because he even made the exact same folds and everything. The cutest artwork in the whole exhibit was a bunny with a flower. It was a pink inflatable bunny with a carrot in his hand side-by-side with a tall flower. My friend and I found it funny considering the fact that there were hundreds of small flowers on the side against the walls. It was definitely something you didn’t want to miss. The best sculpture out of all was the Hulk organ. Now, you may already be confused by the title of this sculpture, but don’t worry, I was too. It’s basically a big inflatable hulk, filled with metal, and transformed into an organ by adding some piano keys and pipes resting on his shoulders. What’s even better is that Jeff Koons is not only an artist when it comes to sculpting, but also when it comes to music, so sometimes he actually comes in and plays the organ. It’s interesting because he made the notes to sound exactly like the roar of the real. So, we hope that you will go and see this exhibit before it closes on October 20thcool sculptures and you can see in person how awesome they are. In conclusion, Jeff Koons has inspired many fifth-graders and maybe he will inspire you too. And remember, if you do, remember to look for these sculptures!